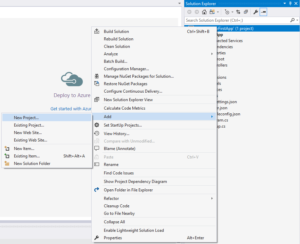 This is the second in a series of posts about our experience using Visual Studio Team Services (VSTS) to build a deployment pipeline for an ASP.NET Core Web Application. 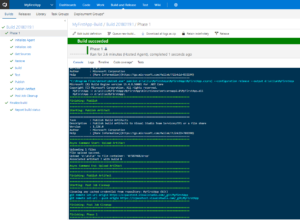 Future posts will cover release artifacts and deployment to Azure cloud services. 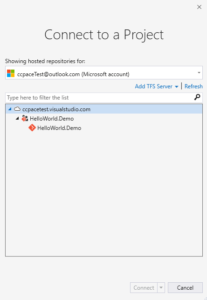 It’s assumed that you have an ASP.NET Core project set up in VSTS and connected to a Git repository. See the previous blog post for details. 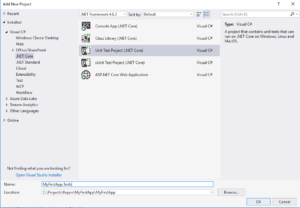 The goal of this post is to set up your ASP.NET Core project to automatically build and run Unit Tests after every commit to source code repository (I.e. Continuous Integration). Select the project from our previous post. Enter any Name that can help you to identify this build. Select an appropriate Agent queue. In this example, we will use Hosted VS2017. Use this agent if you’re using Visual Studio 2017 and you want the VSTS service to maintain your queue. To simplify the process, use the default value for other fields. Go to “Trigger” and Enable continuous integrations. This will cause a build to automatically kick off after every code commit. 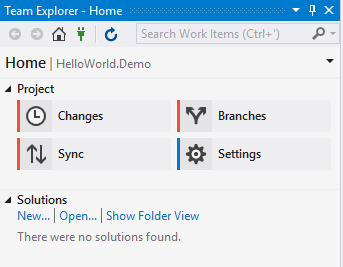 Open the solution (from the previous post) in Visual Studio. Add a new Test Project. 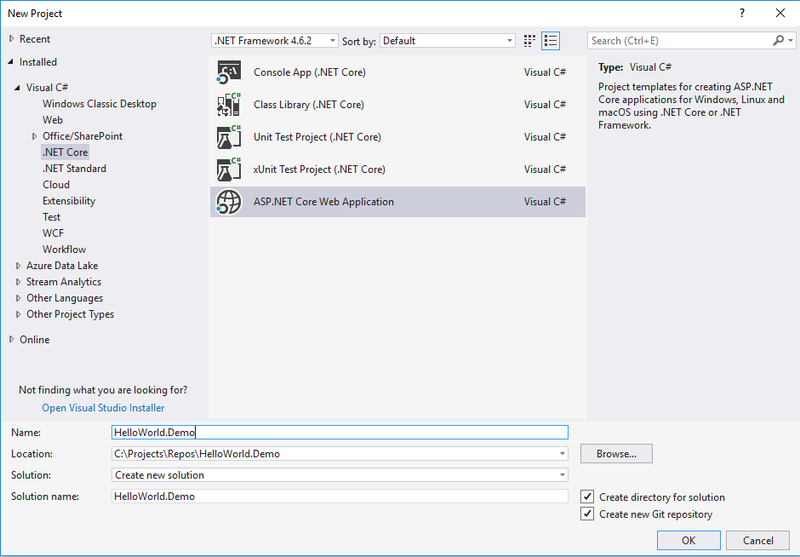 Select .NET Core > Unit Test Project. We will name this project MyFirstApp.Tests. Note: the default build definition will look for test projects under folders that end with the word, “Tests“. So, make sure that a new folder that contains this word is created when you add your Unit Test Project. Commit the changes locally and push it to the remote source repo. 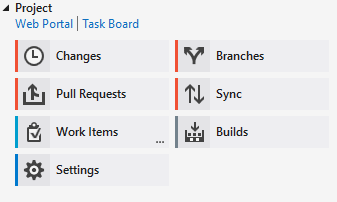 Back in VSTS, you can see that a Build has been triggered. Click on the build number #2018XXXX.X to view the details of the build. Normally this will take a few minutes to complete. Ensure all of the steps passed. You can click on each step to view log details. We’ll demonstrate how to deploy builds to different environments, either via push-button deployment or triggered automatically after each build (I.e. continuous deployment). 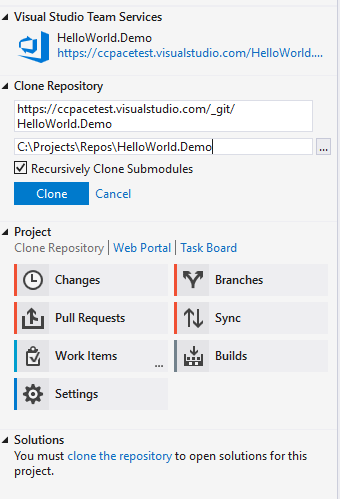 This is the first in a series of posts about our experience using Visual Studio Team Services (VSTS) to build a deployment pipeline for an ASP.NET Core Web application. Future posts will cover automated builds, release artifacts and deployment to Azure cloud services. 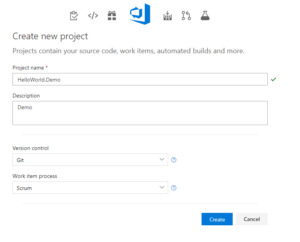 The purpose of this post is to show how to create a new Visual Studio Team Services, or VSTS, project, set up a Git code repository and integrate everything through your Visual Studio IDE. If you haven’t already done so, create a VSTS account using your Microsoft Account. Your Microsoft Account is the “owner” of this VSTS account. Create a new project. This Microsoft Account is the “owner” of this project. 4. For this demo, we will select “Git” as our Version Control and “SCRUM” as the work item process. There are many ways you can work on your project. A list of supported IDE’s is listed in the dropdown below. For this demo, we will use Visual Studio 2017 Professional Edition. Click “Clone in Visual Studio”. This will prompt you to launch your Visual Studio. If this is your first time running Visual Studio, you will be prompted to log in to your Visual Studio account. 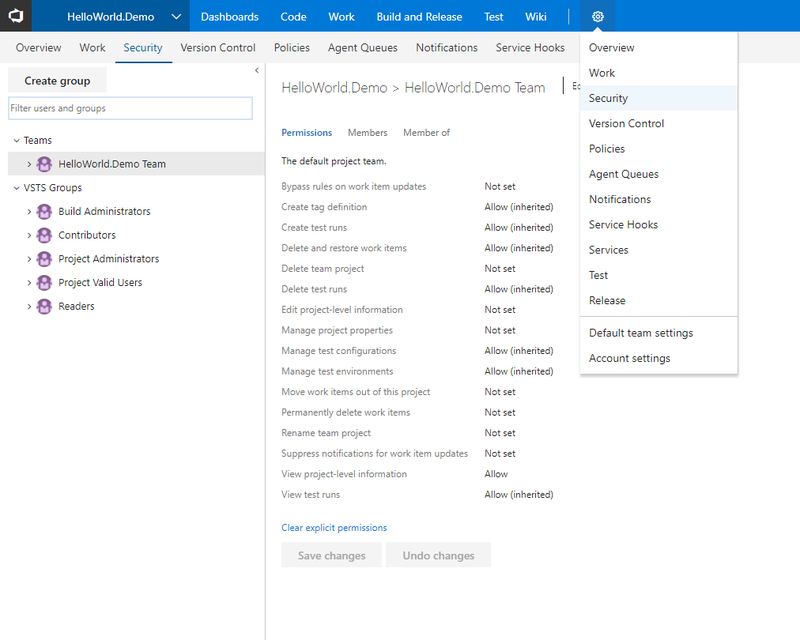 To simplify the process, log in to the Microsoft Account that you used to create the demo project previously. This should give you the admin access to the project. Go to View > Team Explorer > Manage Connection. 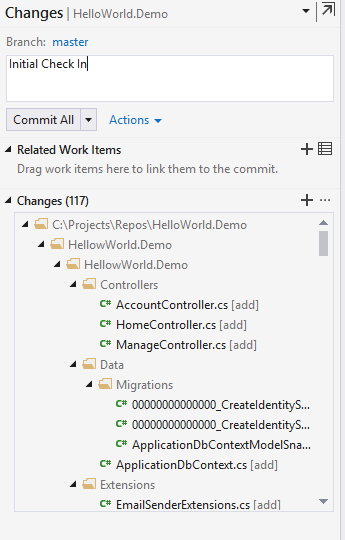 Visual Studio will automatically show you a list of the hosted repositories for the account you used to log in. 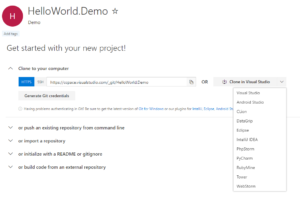 If you are following the previous steps, you should be able to see HelloWorld.Demo project. If you are not seeing a project that you are expecting to have access to, verify the account you log in to or check with the project owner to make sure you are given the right permission. 5. Connect to the project. 6. If this is the first time you are accessing this project in your local environment, you will be prompted to clone the repository to your local git repository. Within the Team Explorer, click the Home button. Under the “Solutions”, select “new…”. Using this method will ensure the solution is added to the right folder. For this Demo, we will create a new project using the ASP.NET Core Web Application template. The solution name doesn’t have to be the same as the project name in VSTS, but to avoid confusion, it is recommended to use the same name. Once the solution is created, go back to Team Explorer and select “Changes”, you should be able to view all the items you have just added. Enter a comment and click “Commit All”. This will update your local repository. To “Push” these changes to the remote Repository, click “sync”, and finally “push”. You can verify this by logging into your VSTS, go to “Code” and you should be able to see all of the codes you have just checked in. a: If your VSTS account is Azure Active Directory backed, then you can only add email addresses that are internal to the tenant. b: You must add email addresses for users who have “personal” Microsoft accounts unless your VSTS account uses your organization’s directory to authenticate users and control account access through Azure Active Directory (Azure AD). If new users don’t have Microsoft accounts, have them sign up.